MEng Aeronautical Engineering student Jose Pellicer Collado, took 2nd Prize in the undergraduate category of the Young Researcher Competition coordinated by the Royal Aeronautical Society with the support of the Council of European Aerospace Societies. 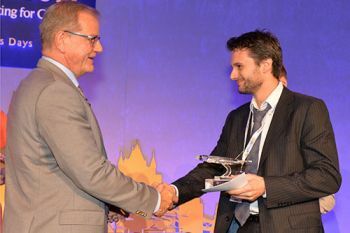 Jose Pellicer Collado, a 4th year student on the MEng Aeronautical Engineering programme, took 2nd Prize in the undergraduate division of last month’s Young Researcher Competition, coordinated by the Royal Aeronautical Society (RAeS) with the support of the Council of European Aerospace Societies (CEAS). 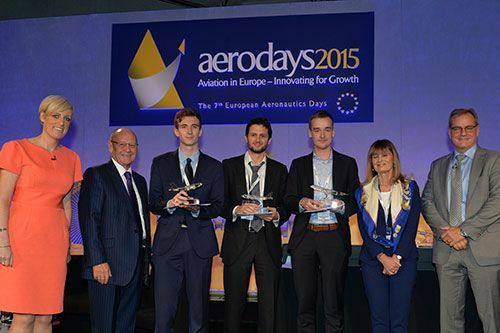 The competition was geared towards both undergraduate and postgraduate students as an experiential learning opportunity to share their research with their peers and the aviation community during Aerodays 2015. All submissions were based around the five broad competition themes of: Efficient and Seamless Mobility; Competitiveness of the Aviation Industry; Greening of Aviation; Safety and Security; and, Skills and Breakthrough. Jose’s research was titled “Experimental Investigation of Flow Around an Aerofoil with an Undulating Leading Edge”. He was prompted to enter the competition by one of his lecturers over the summer vacation while he was working as a research assistant. His runner-up position in such a prestigious competition has also acted as a spur to presenting his research in other fora: “I intend to continue my research project as one of my final year modules with the goal of presenting the results at the September 2016 International Council of Aeronautical Sciences (ICAS) conference which will be held in Daejeon, South Korea. Even though I made this decision before receiving my award, the whole experience of the Young Researcher Competition was very encouraging indeed”. “The overall quality of research submitted to the competition was very high this year and I am delighted with Jose’s performance in the competition, which bodes well for a very successful academic career”.